As mentioned in our first Norway post on Bergen, we arrived to Ålesund aboard the Hurtigruten cruise line bound for Kirkenes. While it made several brief stops on the sail north, the first major port was the beautiful town of Ålesund. How did we settle on Ålesund for our second leg of or Norwegian journey? We had always planned to head North to spend explore some of Norway’s vast networks of fjords in a more rustic atmosphere. We considered venturing further afield, even as far as the Lofoten islands, but the ease of arriving into Ålesund at 10am after our previous night’s departure meant we didn’t lose too much time in transit during our short stay and we could then catch a train from nearby Andalsnes to continue our journey to Oslo. 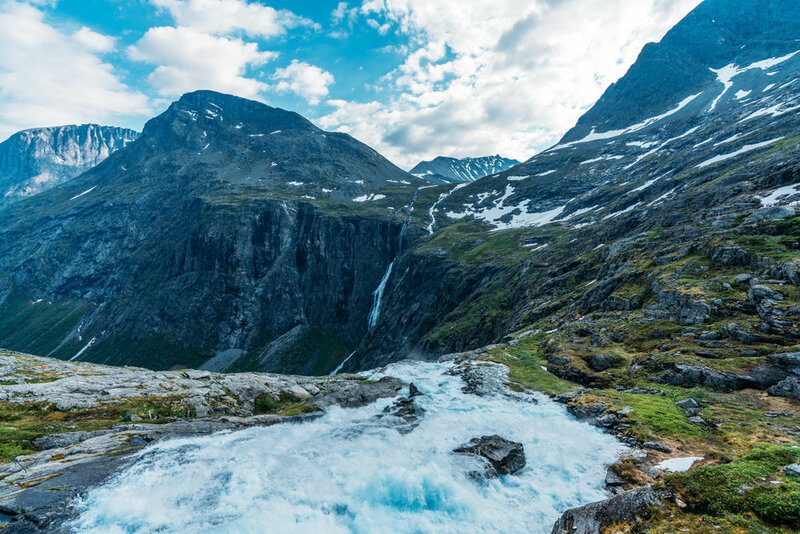 Once you leave Ålesund, you are greeted by the full force of Norway’s natural beauty. It proved to be a perfect stopping point with a near perfect mix of gorgeous scenery and small towns that still carried their weight in both variety and quality of restaurants. It hard to imagine being able to top the few days that we spent in Ålesund, particularly with how it fit together with our mutli-modal journey through Norway. Once again, we explored sans bikes, although some of the tourist and scenic roads mentioned would make for great routes on the bike as well. Sunset on one of the evenings we spent wandering around downtown Ålesund after a stunning meal. You probably shouldn’t visit Ålesund without taking a hike up to the top of the Askla viewpoint. You could drive to the viewpoint cafe at the top but what would be the fun in missing out on climbing the 418 stairs to the top so that you can earn your view? 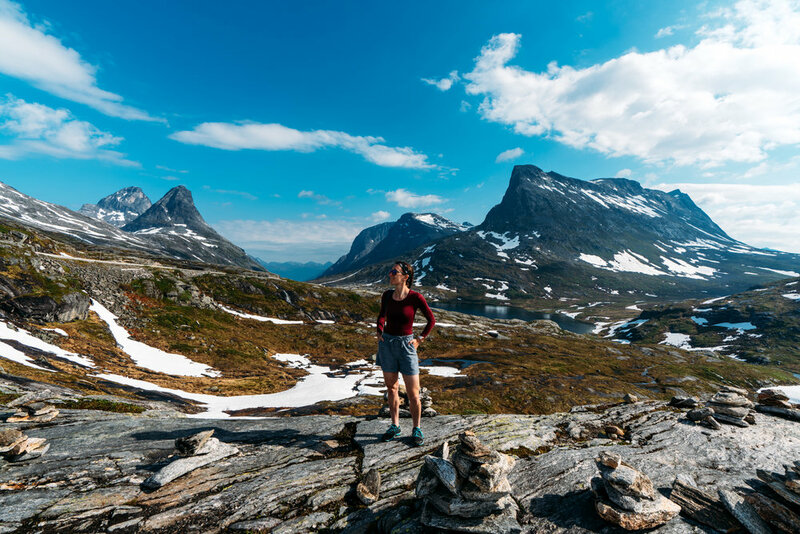 With panoramic views of the city below and the Sunnmore alps, its certainly worth breaking a sweat for - and there are plenty of picturesque points along the way as well. From the top, you can look down onto the colorful art nouveau buildings that litter Ålesund contrasting with the calm blue waters of the sea. The view that greeted us on our first day in Ålesund, midway up to the Askla viewpoint. You can also take in the sites from ground level by strolling through the cobbled streets and visiting the cute stores and coffee shops as well as a few small museums in town. Of note from our visit were Raccoon Coffee and the nearby home goods store which had lots of high end and quirky kitchen tools and supplies. Or, head towards the lighthouse to take a peak inside the fishing museum and some great sunset views by the pier. 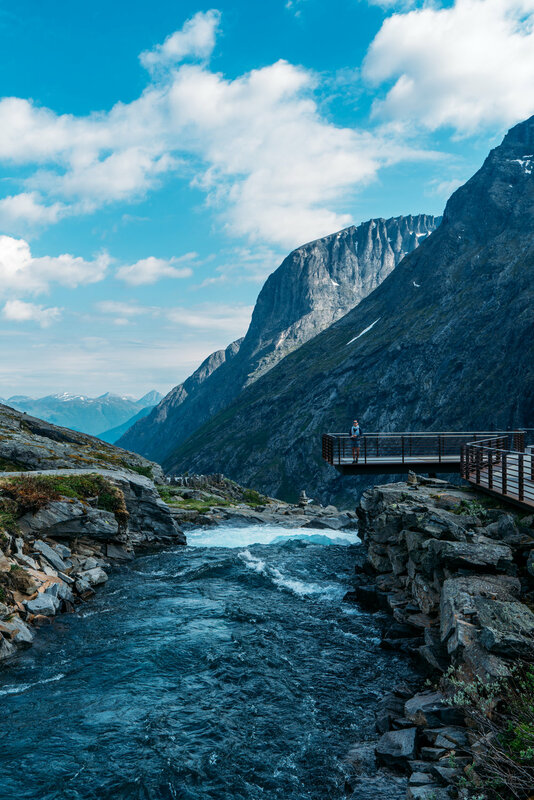 It’s tough to pinpoint a single favorite memory from this leg of our journey, as every twist and turn seemed to prove a new ‘most beautiful’ view and every meal had share worthy moments, but the loop we completed via scenic route 63 through Trollstigen was pretty great. So great in fact, that we completed most of it twice. 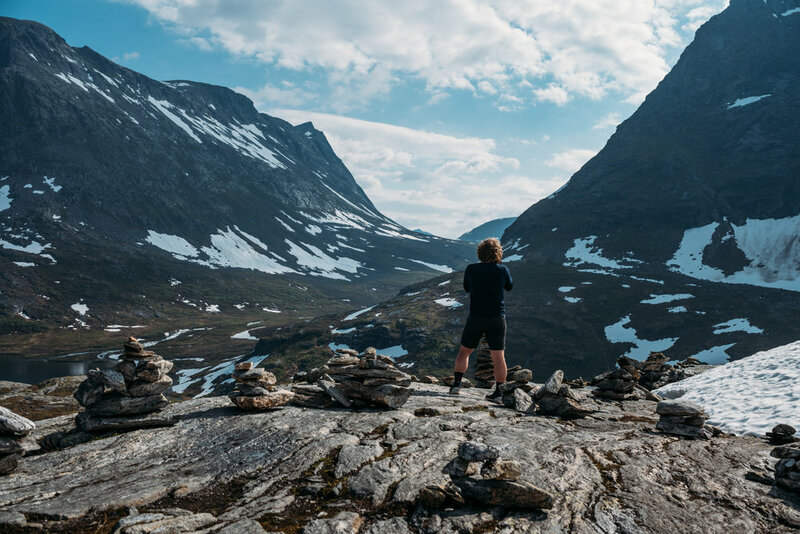 The second time through was not just born out of a desire to see the landscape again, but a camera glitch meant that most of our moments captured were lost and we couldn’t bear the thought of not reliving the serene beauty via photos so retraced our steps on our way to Andalsnes on our final day. I can’t say that I am mad to have gone through the scenic route one more time, and the changing weather meant it looked and different the second time around. Our route started South where we picked up route 63 in Valldalen. Once on route 63, it was one of those ‘pull over here’ moments where every new turn procured a new picture opportunity with snow patched vistas and craggy mountain backdrops. Luckily, the cars and campers were few and far between this time of year so it was easy to pull on and off the road at our whims. We took a longer break at a small outlook which gave us unfettered access to the snow we had been chasing. The weather was 85 and sunny and yet we were playing in the snow. Just goes to show how much snow they accumulate over the winter and the slow process of melt throughout late spring and early summer, which explains why many roads were just opening or not quite ready for cars in late May. After a few snowballs, we headed to the rest stop at Trollstigen Kafe, one of the bigger and more prominent of the tourist route rest stops (though all were gleaning and quite architecturally stunning) complete with cafe, extensive water features that led into a massive clifside waterfall, and hikes and viewpoints over the hairpin road below. Thankfully, just like the roads, the Kafe was mostly empty while we were there. After walking around several height wearying viewpoints, we eventually descended down the hairpin curves past several waterfall runoffs. I got to drive this section and found it quite exhilarating even if my car mates were a little nervous looking out their passenger windows. Words hardly do justice to some of the views along Route 63. We ended the loop with a final stop in Andalsnes where we had a great lunch at Sodalhuset before working up the energy to climb Rampestreken. Matt found this hike through some random Googling and though we knew it was a hefty incline said research implied that it would take perhaps an hour of moderate climbing to reach the top. It took us all of 20 minutes to realize our research was terribly wrong when we looked in the far distance, near the very top of the mountain, and saw the lookout point that was our destination. We preserved through some reasonably technical sections where you definitely didn’t want to fall and ultimately, in just under two hours we reached the viewpoint in all of its stunning glory. We were proud of our exertion, but each time a local resident came jogging past us on the trail like we were standing still we were put in our place. Either way the views from the gang plank (which was not the top, that went on another several kilometeres higher) were worth the effort, even for some of my travel companions who were routinely terrified of heights at the various viewpoints throughout this leg of the journey. Unfortunately, this was one of the adventures where we lost our camera photos - from the big camera Matt had trekked up the mountain on his back while profusely sweating in the near 90 degree heat - and were never able to recover, or willing to climb back up to retake another day. Hence we have simple phone pictures to capture the stunning views (and Matt’s terrified face). Another close tie for favorite route around Ålesund was our ‘ferry day’. We started this journey in the same Southern direction as the loop above, but before hitting Valldal we hoped on a short car ferry headed for Eisdal. We made a quick stop in a small remote town of Nordall where we were looking for a family run farm but instead found a family of dolphins that had wandered into this outcropping of the fjord. From there we headed towards Gerainger via route 63 to get in our fair share of fjord facing viewpoints before descending down the windy road into Gerainger. One of our many random - and completely stunning - pit stops while driving along Route 63. Our route had us heading in Gerainger for a lunch stop at Westeras farm, situated up on a hill above the town. I wouldn’t have changed our plans as the route up to the farm was memorable as well as the views and quaint lunch we had there, but I would certainly caution a visit to Gerainger. Unfortunately it’s a hot spot for the fjord tour cruise ships, who park their massive ships in the small inlet of the Geraingerfjord (one of the largest in the area). The ships lay idle in the inlet emitting out clouds of engine fumes that just hover in the air above Gerainger, which can be seen from all those pretty viewpoints above the city. The town is small, not entirely suitable for hosting the thousands of people who descend off the cruise ships for a day trip. We managed to arrive to town just in time to witness the chaos (streets swarmed with cruisers) but early enough that in our car we could beat all the tourists walking or renting one person swizzle cars. It was sad to see such a naturally pretty area overrun with people and smog. So, unless you can be in town before the ships arrive or after they leave, its probably not worth getting caught in the chaos. The next stop on our fjord tour was to tour the actual fjord, which was probably a favorite of the day. We took the car ferry from Gerainger to Hellysylt. 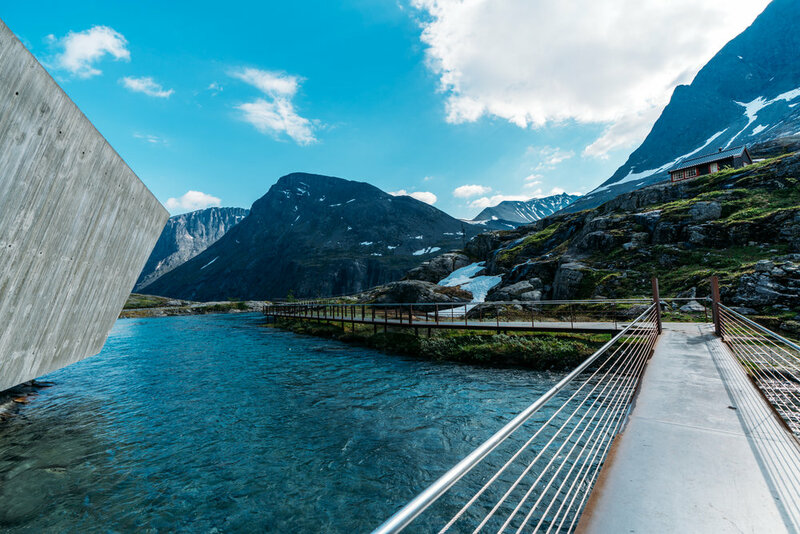 We imagined it would just be a cruise through the fjord, but were pleasantly surprised by some narration on the history of the area and the particular sights we were seeing, included in English. We got to see tons of waterfalls - thanks again to the time of year - and enjoy the scenery and history all while enjoying the sunshine and a crisp beer. I believe that being a car ferry also allowed the boat to be much less crowded than a normal tourist ferry would. And if you head that direction there is a short but pleasant hike to a large, graffiti covered cavern, just a short drive from downtown Ålesund. Sjobua (Alesund) - a group favorite from our in-town dining destinations that we visited on our first day in town for an early dinner after some hiking and exploration within Ålesund. Like many Norwegian restaurants, Sjobua is a seafood haven located right up against the Alesund canal making the views just as good as the food and friendly service. We had a range of fish from scallops and lobster stew to start to locally caught fish and some tasty desserts. There wasn’t necessarily one particular standout, it was just all a very solidly delicious meal. Maki (Alesund) - this was our one nicer meal in Alesund done as a tasting menu of local specialties and it was a memorable meal at that. While the salt cod wasn’t our favorite dish of the night, it was a local specialty that I am glad we were able to try, and everything else on the menu was pretty wonderful. The restaurant is located within the bottom floor of a hotel and the price point was steep but the atmosphere didn’t feel stuffy. If you are looking for a nicer meal out, it would definitely go on the recommended list. Zuuma (Alesund) - we ended up stopping in one sushi joint per stop on our Norway tour, which was an unexpected surprise as we didn’t realize raw fish was so popular. Zuuma was pretty low key but had some very solid sushi and was able to accommodate our early desired reservations given we had a 45 min drive back to our house. Ice Cream Stand (Alesund) - you can’t really finish off sushi any better than with nice cold ice cream (especially on a hot day) and there was conveniently a stand next to a park right across the street from Zuuma. It also didn’t hurt that the scoops on the cones were approximately the size of our heads and completely full of a topping of your choice. We did not share. Westeras Farm (Gerainger) - though the drive up to this goat filed farm on a hill was precarious - not just because of the steep winding roads that led to it or the cattle grates and walls that made fitting our audi wagon through quite tricky and made us question whether you really were able to drive a car up (we consulted google maps satellite view several times during the ascent) - but we also had to dodge the hundreds of tourists that had clearly just deboarded their cruise ships and were swarming every nook and cranny of the tiny town of Gerainger (clearly not designed for mass tourism). We eventually made it up and were greeted by some cute baby goats roaming through the backside of the restaurant as well as clear vistas from the outdoor cafe. We snacked on some light and tasty sandwiches and hearty steak and then topped it off with the perfect waffels filled with whipped cream. It was probably the views and experience both getting there and sitting with nature that made this one memorable above the food but either way it was worth the trek. Raccoon Coffee (Alesund) - a solid coffee and pastry joint we frequented a few times while in town getting ready to set off on our day’s journey. We particularly enjoyed the cinnamon buns and the typical norwegian pancake rolled with sugar. Sodalhuset (Andalsnes) - a quaint cafe right near the base of the Rampestreken made for the perfect pre hike fuel as well as our send off meal before catching the train to oslo. In addition to coffee and tea options from local roastery Jacu, they had a range of craft beverage options and a small but tasty organic menu. The squash soup was a great starter (even though the weather didn’t quite match the occasion) and the pizzas and burger were excellent and unique. Definitely give this one a visit if you are passing through town. A quiet afternoon in Andalsnes - yes we went for swim to test the water. The Airbnb selection in the area is more remote in nature, so you will need to decide where you want your base to be. We found some incredible looking places along the oceanfront side of Ålesund, but considering that the coastline consists of a fair number of small islands, staying out on the oceanfront would have meant longer drives to get around to the fjords, sometimes including additional ferry rides. 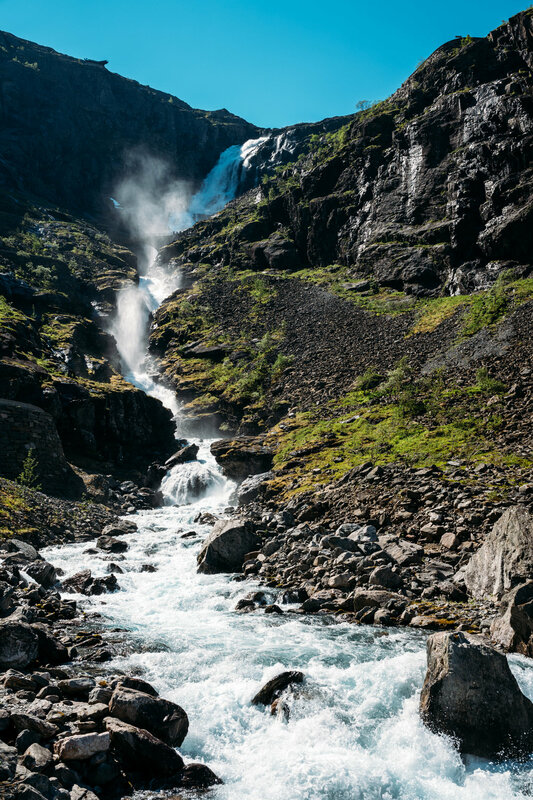 We settled on a property that had a good central location for the places we wanted to explore and were luckily able to find an incredible home right along the Storfjord that was a perfect mix of serene remoteness and proximity to the city. The summer time cruise schedule is quite packed so make a note of where the big ships will be and when. It’s pretty hard to avoid the ships entirely, especially if you visit popular yet small ports like Gerainger, however you can at least time your visits to not coincide with the general cruise deboarding schedule so that you can make it to the viewpoints and restaurants before the crowds descend. 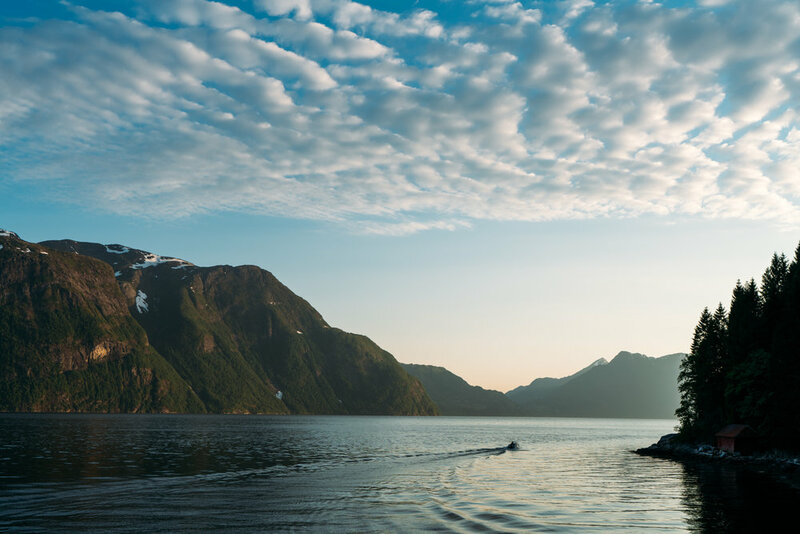 On a similar note, make sure to check the ferry schedules during your planning, as they run different schedules during different times of year and you don’t want to miss the last ferry at any location during your journey and have to backtrack way around a fjord to get to the next crossing. 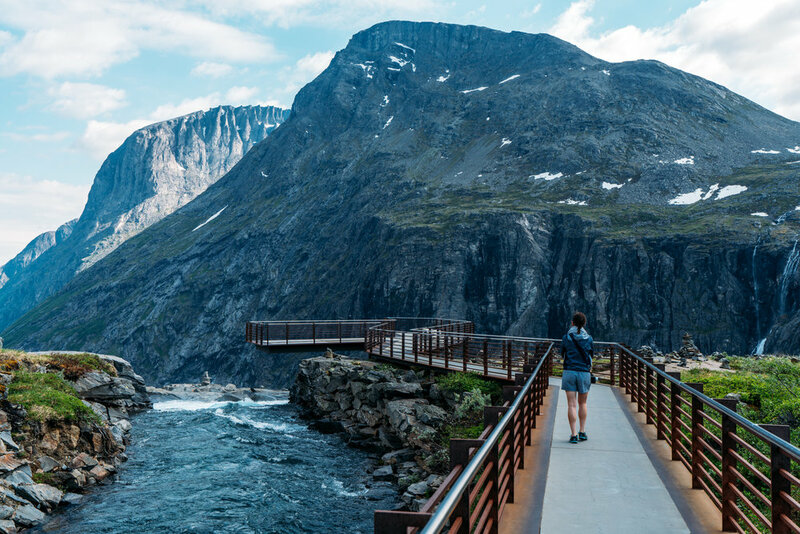 As was mentioned in relation to Bergen, you will also want to check the road closures for the tourist roads - there are some fantastic roads in this region and especially in the early or late summer you will need to be sure they are open and cleared before or after the winter snow. One last sunset view of Ålesund.